Saying nothing about the quality of the candidate himself, I’m increasingly struck by the economic issues the Mitt Romney brings to the table. Because of his professional background, in no small part amplified by the caustic primary debates (and OWS, and partisan dysfunction, and more), the national echo chamber is filled with debates about the bloated income share of the top 1%, the favorable tax treatment of investment income over paychecks, and whether debt-leveraged private equity firms actually add net value to the economy. In this regard, I wanted to return to one of the points I made here yesterday: the increase in the use of “pass-through” income. One reason multi-millionaire investors like Gov. Romney face 15% tax rates is because they engage in corporate activities but avoid corporate taxes. They do so by taking advantage of policy changes that have made it easier to pass capital gains through the corporation to their personal income, where, in the case of PE managers, they tap a double loophole. First, capital gains are taxed at less than half the rate of normal income, and second, even though these gains are really earnings for the fund managers, they get to claim them as capital gains (this is the notorious “carried interest” loophole). These are the type of dots we need to keep connecting as this debate progresses and we can thank the former MA Gov and his opponents for introducing them so effectively. Share the post "Just Passing Through"
10 comments in reply to "Just Passing Through"
I think there is merit to the pass-through structure, although I agree with you that there are huge loopholes in how it can be manipulated. For my part, I own a small business that is an LLC and my “benefit” from doing this is that the money I am paid is taxed at the individual rate, but I am also required to pay both sides (employer and employee) of Social Security and Medicare. I’m not going to stop running a small business because I have double the FICA/Social Security taxes I would if I was an employee for someone else, but it does add an element of ‘ouch’ to running a small business. Agree–the key difference here is you’re not using pass through as a loophole to take advantage of the lower cap gains rate (your income is earnings, and it’s taxed as such) and the carried interest play (earnings treated as cap gains). I think the worry is the ever present law of unintended consequences. It seems fair and right to all of us to close this (and many other) loophole. But what new loopholes will be found in the regulation closing the current ones? What businesses will be shut down or detrimentally altered as a result of closing these loopholes? I’m not saying we ought not do it– just that we ought to be prepared for, well, unintended consequences. I think the worry is what it has been for the past 30 years — if the make the economy a place where lots of people can find prosperity in exchange for labor, then women, African-Americans, brown people, formerly poor people, LBGTQ folks, and all the other Americans conservatives hate will have access to it. That’s why I don’t believe Mitt Romney will be the candidate. The leaders in the Republican Party just are not going to want Mitt as a constant example as the congress grapples with changing the tax code. It must be nice to be in a bracket that allows taking advantage of such opportunities, many of us (99% +or-) aren’t. Romney’s casual almost flippant attitude toward wealth shows that he is comfortable with it. It also shows that he is unaware that there are many people in this country who make less in a year than he makes in a day and if he is aware, he has little or no compassion for them. 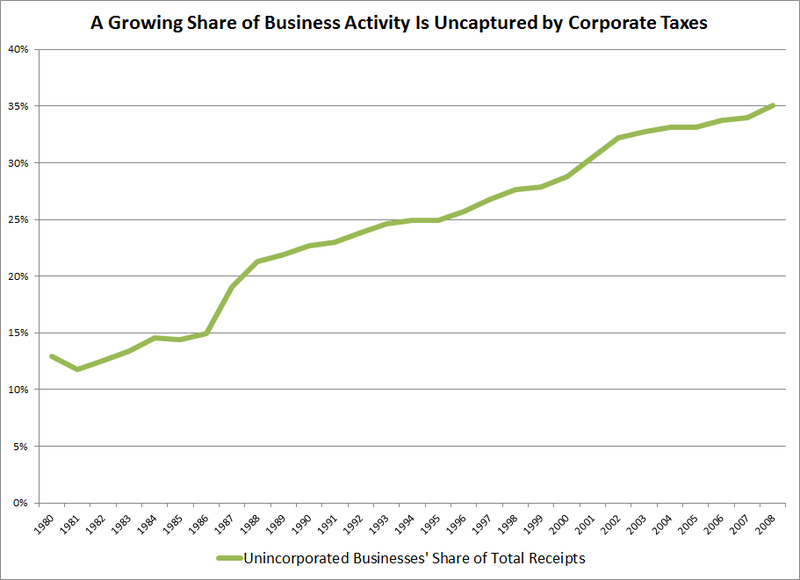 Used to be the corporate tax rate was lower than the individual tax rate, couldn’t that explain the shift to non-incorporated business income in part? One more thing … in the late 80’s is when a huge increase in Hostile Takeovers was happening, right? That certainly shows up on this chart. But there really isn’t any current information on how that trend looks today, or at least I don’t know where to look for it. Does anyone keep track of the incidence of Hostile Takeovers? If so, could we tie that information in with all the other charts in re wage stagnation, etc, and determine a correlation? This is important stuff!!! Thanks. Thanks to Jared for a gGood answer to the folks who claim that the 15% is already double taxation and a job killer. Wage taxes on coal miners of 25% plus 12% combined State Income and Local Income Tax is okay, but don’t touch Mitt’s passive coupon payouts. The greedy will keep asking for more, and true Americans will keep settling for less – until a day of reckoning, when anger boils over and folks revolt as elsewhere in this world. Wealth is the accumulation of money, and money is only the original result of producing good and services, or unfortunately, stealing through graft, larceny, corruption or government authorized monopolies. Wealth is not “produced” by playing golf or drinking with buddies – that’s using wealth, the fruits of someone’s efforts, but not necessarily yours. I’ve been in conversations with guys who own strip malls and believe they ‘produce’, despite sitting on ever increasing mountains of money via ‘rent’ income. In their minds, wealth = success, and the last thing on earth they want to do is justify their wealth. They’ll get as vehement as Joe Scarborough (or Mitt Romney) if anyone points out that ‘rent seeking’ is a parasitic economic activity. Romney seems – like my strip mall owning acquaintances – like a True Believer in finance capitalism and rentier wealth. It has sometimes struck me how fixated the strip mall owners seem to be about ‘taxes’: as if *in their minds*, an economy is like a pie chart that either shrinks or grows. What matters to them is ‘getting a bigger piece of the (shrinking) pie’ than anyone else. It’s a zero-sum mindset. But recently, I have come to suspect that their mantra of ‘tax cuts, tax cuts, tax cuts’ create negative cognitive feedback loops that perpetuate a very limited, outdated view of ‘what an economy *is*’. It’s a self-defeating way of thinking. The more they fixate about ‘cutting taxes’, the more sclerotic and rigid their economic ideas become. I have been intrigued over a period of about 16+ years now to observe that their economic concepts never seem to develop beyond a very simplistic view, often obsessing on tax structures. In contrast, the educators and tech folks and ‘entrepreneurs’ that I encounter have far more adaptive, creative ways of talking about economic behavior. The latter group have created the new products and engaged in economically generative behavior. In other words, obsessing about tax cuts is probably an intellectual and economic impediment; it limits what you think about; it’s like having a set of mental blinders. It’s intellectually and economically suffocating, and IMVHO has impeded a national conversation about what kinds of economic activities **create** value (as opposed to merely rent, which is always a simpler proposition). Given all the obsessing on tax structures, it’s not surprising we have no national industrial policy; so much energy and focus has been sucked up by rent-seeking that we’ve not thought creatively about what an economy *is*. Or could be.